Nothing personal, just opinions, even if it is as good as Court Opinions. Next time your Grandpa tells you about how much better things were in the olden days, ask him to explain the logic behind a brick-sized, foil package of Philadelphia Cream Cheese. I will bet this inferior packaging has been around since long before your grandfather ate his first bagel. Philadelphia Cream Cheese does offer more convenient storage tubs for bagel spreading, but their higher price weighs heavily against the convenience. The wisdom behind squeezing a brick of mushy, creamy cheese into a paper thin, foil package is not much better than those TV dinner sauce and gravy packages we reviewed last month. Now, I realize cream cheese is not just for bagels; it is commonly used in baking and cooking recipes. Still, why not put it in a re-sealable box, so it can be easily sliced into the precise portions you need with no mess or hassle? Wouldn’t this be better than forcing you to scrape and lick the remaining portions from your fingers and foil? Even if your intention is to throw the entire brick of cream cheese into a pot of steaming hot, mashed potatoes, why should you have to worry about peeling it out of the foil and getting its mushy contents on your hands or leaving some of it stuck behind on the foil? 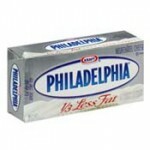 I have nothing against the Philadelphia Cream Cheese folks. They make a very tasty product, but why force consumers to cuss and complain so early in the morning? A groggy man or woman ought to be able to enjoy a bagel in the morning without suffering the undue stress caused by its preparation. It’s almost as bad as peeling, thinly sliced, greasy bacon apart from a plastic package. Are you listening Grandpa? Bacon packaging is just another example of a poor idea from the generation who insists on telling us how much better things were in their day. These latest two product packaging examples serve to remind us that people really haven’t gotten any more stupid after all these years – and that is comforting news. Once you’ve experienced a Product Packaging mistake, you’ll wonder how it happens. I tore into the Frozen Box of Claim Jumper Chicken Fried Steak, hoping there would be little instructions to read. When the frozen, sealed plastic package of gravy fell from the box, at once, I knew there would be trouble. I’ve experienced this concept before. You know, the one where you heat up a hot plastic bag until it turns into a seething hot liquid which is too hot to handle while at the same time you try to figure out a way to get your hands on it without scalding yourself? Somehow, you finally manage to open the plastic pouch, but not before the scalding hot gravy, which belongs on your mash potatoes, runs down your fingers, palm and underside of your forearm. All this trouble is the result of an attempt at making a quick, convenient dinner. Well, I’m here to tell you: This is the kind of convenience that is too stupid to be invented by a human being. I honestly think the packaging marketing gurus must use a random-product-packaging-idea-generator-bot to come up with hair-brained ideas like these. Who Invented such a Poor Product Packaging Idea? In all fairness to the Claim Jumper folks, this isn’t their idea. Some other freaking genius came up with this and sold it to all of the upper-echelon MBA marketing gurus who work for the food and TV Dinner industry. I’ve seen this with other products from other other companies. It’s been around for years, so the most astonishing thing about this product idea is that it has lasted so long! How about putting the gravy in one of those cheap little, removable cardboard or plastic trays with a layer of plastic that peels off? You remove your gravy tray from the dinner, while the rest of it cooks. Next, you simply put the gravy tray in for a minute or so, peel off the plastic, then neatly, effortlessly and painlessly pour it over your mashed potatoes.